2nd place for both of them, which is a first for both of them as well. This weekend marked the first soccer tournament we, as well as many other parents will be hauling their children to on the weekends. For the Nunes fam, we had our Madi make it to her first final in a tournament, and we had our Kiss lose her first final in a tournament. 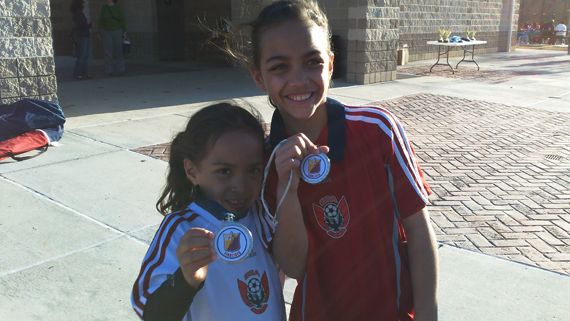 Both, by the way, are very important learning opportunities in the competitive soccer world. In setting up our chairs and getting all ready for the first game, it took me all but 2 minutes to remember some different “types” of parents who grace their presence on the sidelines while their son/daughter play 60 to 90 minutes of soccer. Many recreational soccer teams will have maybe 2-3 of these types of parents show up, but you will without a shadow of a doubt see at least 8, if not 10 of these parenting types show up to each game fielded by competitive club teams. These parents take sideline coaching to the HNL. These guys bring everything. They arrive to the fields 45 minutes early in their Suburban, pull out the 10 person tents and the reclining chairs with cup holders and a cooler in the middle. Heck if they could bring an open flame they’d probably Q up some burgers and dogs. They’re usually very friendly, and willing to share any and all shade with the less fortunate (slacker) parents. The same as The Joneses, except on opposite day. These guys are usually the ones sneaking in to stick their sweltering sandaled feet in the last bit of shade in the back corner, while their youngest kid in the stroller with 3 working wheels is probably suffering from dehydration due to the lack of water bottles in the grocery bag that’s carrying a diaper and 2 wipes in a ziploc. Ok, we all do sideline coaching. At least we’re all guilty of doing it at one time or another, but this parent swears up and down that what they’re coaching their child do is actually helping. They’ve known to do one or more of the following: Cheering when their child pushes down another player / Yelling at the coach to “Put my kid in, they’ll win the game for you!” / Laughing incessantly when their child pulls a juke move on the opponent… and so on. This parent insists that reverse psychology is the way to go. They usually are reminding their child 70-80% of the time of their inadequacies. For some reason their child tends to always play goalie. For some reason in-between games, this parent pulls out their “coffee tumbler” in 85 degree weather (not that coffee in 85 degrees is bad or anything) and really thinks nobody notices their slurred cheering. C’mon guy. Any kind of fall, bump, or shove their child is involved in, this parent is off their chair ready to run out on the field with their first-aid kit and stretcher. Also, they are probably still breast-feeding. Their 7 year old. In between games they have their kid doing wind-sprints on the side to you know, “keep them fresh” for the next game in 3 hours. “5 minutes late is 10 minutes too early, and it doesn’t matter because they’re not going to start without me anyways” is probably a common thought when they pull up to park. This one is my favorite. They’re guaranteed to have the latest and greatest DSLR with a lens the size of his child’s upper torso. If allowed, they would probably place a Red camera on wheels and take great tracking shots at 60,000 fps on each and every breakaway. Just ’cause they can. As I shared with you in the first paragraph, I’ve definitely showed all (except #5, but I don’t judge) of these while at their games. More recently though, I’ve really concentrated on just trying to be their cheerleader, and encouraging them no matter what. They truly feel down after a loss, so they don’t need me or anybody else to remind them of that. They also love when they win, and just knowing they’re sharing that win with you really means a lot. Do you remember how your father/mother was at your events? How do you think how they were on the sideline, shaped who you are today? 1. #1 would best and most accurately describe us. 2. They were both my biggest fans. Very supportive and never missed a soccer game or hockey game. 3. I think I am quite supportive and I definitely cheer a lot! They have shaped my life by showing me the importance to encourage and celebrate others. Hilarious, post Ben. Mickey Goldmill…. bahaha! 1. When my kids get to the age where they do organized sports, I will be #1. No shame. 2. My parents were like Ron Howard. Not with the expensive equipment, but they had to capture every moment. From the night before when I laid out of uniform (cup and all), to the post-game, all roughed up shot. 3. Well, I definitely want to capture every moment with my kids… for sure. I also want to balance the cheering/encouraging to challenging them to do their best. They can control two things: attitude and effort! You’re absolutely correct on what they CAN control, and sometimes as parents it’s difficult to remember that. I’m definitely a Fetty Bord and a Ron Howard. LOL. True Story: I put my son to soccer practice and one drill was for the coach to throw the ball and he would name two players and they each had to try to score first. My boy got thrown in with a girl. The correct advice would have been “Gabriel, be nice and gentle she’s a girl”. Yeah, I was all like, “Go Gabriel, be aggressive, run faster, don’t let her touch the ball”. Mad at you? Not at all, ’cause Gabriel wasn’t playing against my daughter. Had she been on her team when she was playing co-ed, well…that might be a different scenario. However, let’s just say my youngest (madi) could definitely hold her own against dem boys. Elbows. That sounds very violent Dustin… even for a southerner. LOL! LOL. Thanks for having my back, D! You know what they say… when a plant is moved out from its original pot and “transplanted” to a new one, the plant gets weaker. Or have more colorful blossoms, depending on the type of plant. I hear watermelons get sweeter if transplanted as well. I wonder if Avocados do the same. Oh for sure prettier. That actually explains a lot. What does it mean if Sarah’s (youngest daughter) favorite part of the U11 final was her sister putting a girl in the dirt? Should we be scared? Oh, who am I kidding I liked it too since it was a clean throw down. Agreed, that girl had it coming to her. Wait what? I am laughing right now! Too many memories – from the beaches to the heat, all the equipment was stored in the garage forever. Miss those days son. Our parents lived in a different world where work came first. I’m glad we have your memories on film to share with you guys and your children – they will keep us laughing in our old age…oh yeah, that’s now! Oh man, the games on the beach in Santa Barbara were the BEST! Soccer, surf, tri-tip, rice, watermelon and then Chocolate dipped cones on the way home. Heaven. I am/have been a 2, 3, and 4. But never a 6 no matter how hard my 2 year old tried to latch on. You have the midas mouth, my friend. Everything that comes out is comedy gold! Solace it is, I miss those times. This is awesome! Love the list post structure. I played soccer as a kid and my folks were between #4, 8 and 11 (cheerleader). As a parent I just try to make sure my kids are paying attention while their playing and be a cheerleader. Although, it is hard not to get caught up in the game, especially when they’re doing really well. Cheerleader’s the way to go, for sure. It’s very difficult, and impossible to not get caught up when your kids team is doing PK’s in the final, talk about stress! My Dad was a great spectator. Always encouraging and very positive. I learned a lot about sportsmanship from him. When it comes to family events, the only ones I came close to are #2, and on rough days #7. But I’ve definitely experienced all ten. Great list, Ben! Oh man, #7 is me all the way during allergy season when I’m drugged. I can’t keep my eyes open for the life of me! I think it’s super important as a dad to be that great spectator, and it’s awesome you learned a lot from yours. Great way to paint that picture Tyler, that definitely sounds like an awesome memory. Some reason, I don’t have a difficult time picturing Riss yelling at her mom to stop. At least Riss didn’t have to put up with cowbells and upside-down “GO GOOB” signs (read: any of Chris’s football games). LOL! Ben, it’s nice to bask in your humor! This one is a keeper. Awesome man! That gave me a solid laugh! Haha!